Florida has a total of four planting zones ranging from zone 8 in the north where the average nighttime winter temperatures get as low as 10 degrees to zone 11 in the Florida Keys where the average nighttime winter temperatures get no lower than 40 degrees. This leads to a wide range of trees in the state---some that thrive in the colder areas and others that love the tropical heat. Trees with pink flowers can be found in all areas and make a good contrast color for gardens with darker-colored flowers, making them stand out all the more. All-pink gardens are another choice. Pick pink flowering trees and other plants with different shades of pink from pale to dark, and it will not look like one color at all. Chinese hibiscus (Hibiscus Rosa-sinensis) is also known as Rose-of-China and Hawaiian hibiscus. The tree grows up to 15 feet high and produces dark-green, shiny leaves and bell-shaped flowers that grow up to 6 inches in diameter and bloom all year long. 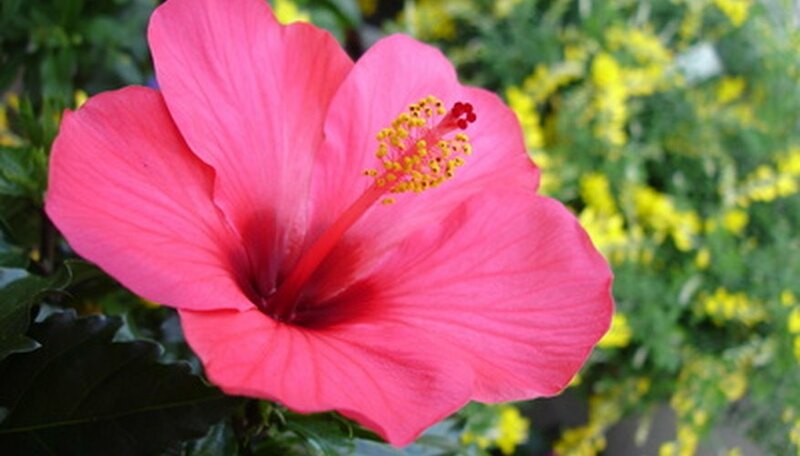 Plant the Chinese hibiscus in full sun and a well-fertilized, well-drained moist soil. The tree does not do well in a frost, but can be planted in containers and brought indoors in colder areas. The plant is a favorite food source for butterflies. Chinese hibiscus is hardy in Central and South Florida. Crape myrtle (Lagerstroemia indica) grows as tall as 40 feet and produces smooth green leaves and flowers that bloom for up to four months. Tuskegee, Miami, Seminole, Tuscarora, Potomac and Tonto are varieties that produce pink flowers. Small brown or black fruit appears when the flowers are done. Plant the crape myrtle in full sun and a soil that is not overfertilized. The tree can be grown in North and Central Florida. Pink trumpet tree (Tabebuia heterophylla) is also known as pink tab. The tree grows as tall as 50 feet and produces leaves similar to those of a palm tree that appear after the 3-inch-long pink, trumpet-shaped flowers that grow in clusters at the end of the branches. Plant the pink trumpet tree in full sun and any kind of soil as long as it is well-drained. The tree is hardy in South Florida and the Florida Keys. Saucer magnolia (Magnolia x soulangeana) is also known as the tulip tree and Japanese magnolia. The tree grows up to 30 feet tall with an almost equal spread and produces dark green leaves that grow from 5 to 8 inches long and appear just after the 3- to 6-inch long, fragrant, saucer-shaped flowers. Plant the saucer magnolia where it can get sun in the morning and filtered shade in the afternoon. The soil should be rich, organic and moist. Saucer magnolia is hardy in North and Central Florida.